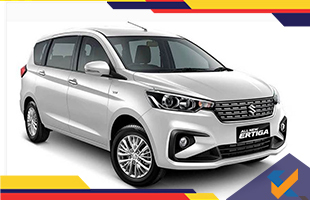 Maruti Suzuki has revealed its 2nd generation Ertiga last month in Jakarta and this took place at the Indonesian motor show 2018. Even though it is expected that they will launch new MPV within this year Diwali in India, five amazing, as well as interesting thing about this Maruti Suzuki MPV, is as follows. This all-new model of Maruti Suzuki Ertiga depends on the new Heartect platform of the Japanese brand. It has also already shared with Dzire, Baleno, Dzire, and Ignis. Because of its underpinning, this 2nd generation car is also expected to be stiffer and lighter than the MPV which is outgoing. The wheelbase of the car remains the same with 2,740mm and is longer, little taller and wider when compared with the previous model. Since the size is increased, its boot space has been reduced to 153 liters. It offers a new look by providing tail lamp and D-pillar. This model has been made to be powered by all-new petrol engine of K15B which makes 104hp and a torque of 138Nm. It is also expected to be replaced by the 1.4-liter engine of MPV and this makes this new model to be more efficient because of bumping output figures to 12hp as well as 8.4Nm. This new Indonesia's model will have a 5-speed manual and 4-speed gearbox of the automatic transmission. The fuel efficiency of the engine has claimed 18.06kpl whereas its outgoing model has claimed 16.73kpl. At present, Maruti is developing diesel engine of 1.5 liters to use in some of their cars. This Ertiga model might be one among the first models to have a diesel engine. Due to increase in its rear overhang length and little wider in its overall width, Ertiga has been expected to facilitate large cabin space for the passengers. The stablemates of Suzuki have been also shared with the new dual-tone dashboard, bobs, and bits inside the MPV. The flat-bottomed steering and instrument panel of the MPV has borrowed from Swift hatchback. The dashboard is made to be mounted with aircon vents of vertically aligned, touchscreen infotainment of 6.8 inches as well as cooled cup holders. The model of India-spec will have spied testing and this testing will take place in Indonesia and this model will also include an automatic system for climate control. This feature was missed in the model of Indonesia. Also, this India-spec model will be sent to Indonesia to have spied testing after it has been completed in New Delhi. Maruti has made this Ertiga model stand against the Innova model of Toyota. Moreover, Innova is one among the premium products in the market of India regarding its price as well as equipment. This Ertiga is now expecting to undercut that one by providing Ertiga as the most affordable option for the buyers. At this same time, Mahindra is also developing a rival to this Ertiga which codename is U321.